Avoid traffic on moist soils to minimize the most common factor behind soil compaction. Use a knife, trowel, or shovel to dig into areas where after it rains water puddles and drains slowly. Compact soil structure is a massive block that lacks pore space to allow good air infiltration and drainage. With hand tools, loosen small compacted spots to a depth of 6 to 8 inches. Seed as described in the Step Two video on patching bare spots. For larger areas use a core aerator. It pulls a plug of soil from the lawn which creates small holes and leaves soil cores on the surface. Once the cores are dry use a rake to break up and redistribute the cores across lawn. Core aeration is most effective in late summer when temperatures are starting to cool and the soil is only slightly moist. 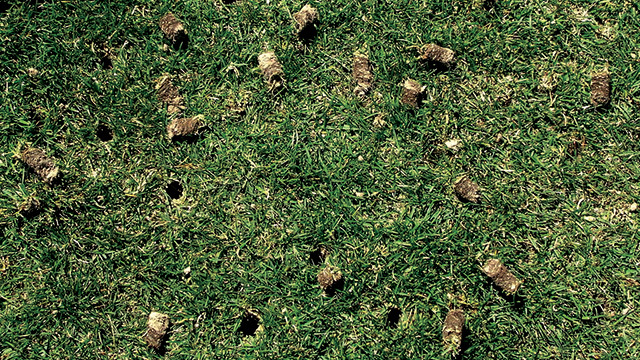 After aeration, air and moisture can penetrate the compaction through the holes. DIY people might find a core aerator at a local equipment rental center or contract with a local landscape company for this task. Plugs on lawn after core aeration.